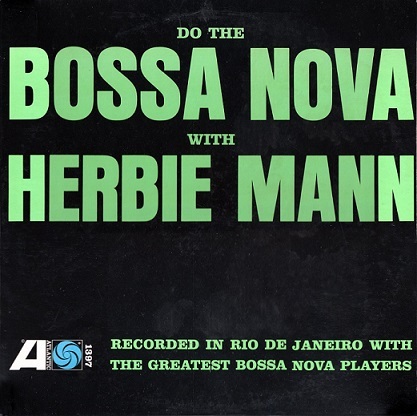 Tracks 2 & 6 – Herbie Mann & the Sergio Mendes ‘Bossa Nova Rio’ Group: Paulo Moura, alto sax, Pedro Paulo, trumpet, Sergio Mendes, piano; Durval Ferreira, guitar; Otavio Bailly, Jr., bass; Dom Um Romão, drums. Tracks 3 and 5 – Antonio Carlos Jobim, arrangements, piano, and vocal on 5. LINEAGE: Atlantic 1397 mono pressing; Pro-Ject RM-5SE with Audio Tecnica AT440-MLa cartridge; Speedbox power supply; Creek Audio OBH-15; Audioquest King Cobra cables; M-Audio Audiophile 192 Soundcard ; Adobe Audition at 32-bit float 192khz; clicks and pops removed with Click Repair on very light settings, manually auditioning the output; further clicks removed with Adobe Audition 3.0; dithered and resampled using iZotope RX Advanced. Converted to FLAC in either Trader’s Little Helper or dBPoweramp. Tags done with Foobar 2000 and Tag and Rename. Music scholar David Treece, whose book on bossa nova and related genres is highly recommended, singles out this album for having helped to establish the idea of bossa nova as a primarily instrumental genre in the Anglophone world, rather than a song form where the vocal delivery and lyrical content were essential to the whole aesthetic. This is a very valid point. The album’s liner notes make the pitch that this is the real thing, “the real bossa nova,” in contrast to the “synthetic” representations available to non-Brazilians at the time. And those notes show a perceptive understanding of the music by outsiders that was rare. But the North American culture industry still can’t help contributing to misreadings of the genre – in the eye-catching simplicity of the album cover’s design, the words “Do The Bossa Nova with Herbie Mann” conjure images of people attempting to do a non-existent dance. One of key distinguishing features of the genre is that, unlike nearly all Latin American music genres, bossa nova did not have any corresponding dance tradition. It was a music that one sat and listened to. Treece’s observation about representing bossa as an instrumental music is made in passing (mentioned together with, if I recall correctly, Stan Getz & Charlie Byrd’s early forays). But what I would like to know more about is how this album fit into the sub-genre of jazz bossa that was flourishing in Brazil. From one angle, we can answer that question simply: it didn’t fit anywhere, because it was never released in Brazil, in spite of having so many important Brazilian musicians and composers involved. Was this viewed by them as just another session in the whirlwind of musical activity that was happening in Rio in the early 60’s? Or did they take away any specific memories or experiences from working with this white Jewish jazz guy from Brooklyn? Herbie was a popularizer, which of course was and is anathema for many jazz heads, but I have always admired him – he gave many young up-and-coming musicians a place in his bands, and he was attempting serious engagement with “world” music styles that informed the jazz lexicon, at a time when the majority of records released in the US that encompassed Latin or African music were still relegated to the “exotica” category. Is this the best jazz bossa album you’ve never heard? No, almost certainly not. Mann’s playing is often busy, much more beholden to bebop and not quite getting to the place of relaxed, parsimonious phrasing that is characteristic of the genre. But it’s also not a bad jazz bossa record by any means, and quite a good Herbie Mann album. His choice to end the record with his own composition, Bossa Velha, at least tells us that he learned something important from all the great Brazilian masters whose compositions make up the majority of the material: that bossa nova has Afro-Brazilian samba at its foundation, and could not have existed without it. Never-mind that the album jacket’s liner notes (reproduced below) make it sound as if there is only one Escola de Samba in the entire country: a proper identification would have specified which samba school lent their percussive orchestra to the track, which shows us that Americans still had a lot to learn about Brazilian music in 1962. The song is an object lesson and respectful homage to all those who let opened the door of Brazilian music for Herbie Mann and showed him around the joint, with a message that was often lost on foreigners, then and now. When playing Brazilian music, play it like the Brazilians do. That’s Herbie Mann’s musical philosophy. And where better to imbibe the flavor and reality of Brazil s bouncing baby, the Bossa Nova, than in Rio de Janeiro ? Exactly. That’s why Herbie Mann took his beard and his two flutes to Rio to record this album. It may come as a pleasant shock to those who’ve only heard what Mann calls “the synthetic Bossa Nova” recorded in New York and Los Angeles to hear the genuine article. The real Bossa Nova is a jazz-flavored samba, but it is played in a crisp, clean style undiluted with trick rhythms or pseudo-Latin phraseology. The Bossa Nova is a modern product of a modern people ; it borrows some from the traditional music of Brazil and some from the jazz idiom of the North Americans, but it is always itself . You’ll hear just how varied the Bossa Nova can be in these eight selections. Mann plays his flute against several backgrounds, in different tempos and in different moods. You’ll hear the Bossa Nova fast, the Bossa Nova slow, the Bossa Nova with strings, with jazz, with a near-primitive outburst of percussion. And always in the foreground is Mann’s flute, sometimes swinging, some­ times haunting, always blending perfectly with the accompaniment. There are five groups which perform with Mann on this album. Perhaps most intriguing is the work of Antonio Carlo Jobim , who sings his own One Note Samba here. This is the first time Jobim has re­ corded this composition; Mann said he did it only because he was “disgusted” with the way it has been done on American recordings. Jobim also plays the piano on this and on a beautiful melody, Amor Em Paz. Mann originally discovered the Bossa Nova when he played in Brazil in the sum­mer of 1961. The Brooklyn-born flutist is known as a musical internationalist, and he adapted himself to this new rhythm with the same ease as he had to African music when he was there. The Brazilians told him he played it like a native, and when he came back home, he reorganized his own group so he could play it. The Bossa Nova, he says, “revitalized ” him, and he began playing it for American audiences. He went to Brazil again in the autumn of 1962 just to make these recordings, so that America could fin­ally hear the real Bossa Nova. It’s the next thing to being there ! Tagged Baden Powell, Bossa Jazz, Dom Um Romão, Herbie Mann, Sérgio Mendes, Tom Jobim. « Larry Coryell – Coryell (1969) – Special Blog 10th Anniversary Post! Paul Winter was another awkward, fake, phoney, or some would describe him as just bad, American jazz instrumental recording artist who went to Rio and recorded with some of the best musicians in the Bossa Nova scene. He had some similar results compared to Herbie Mann. I passed on taking a look at this post until now, because i already had this album (thanks Loronix and Zecalauro). But your post on Bohannon spurred me to take a look at your thoughtful writing. Herbie Mann has always elicited mixed feelings – sometimes it seems he’s phoning it in – other times he is great, really connecting with the other players, and with me as a listener. He certainly deserves credit for opening my ears to Duane Allman (Push Push is not where most folks start with Duane Allman) and his Gagaku and Beyond album got me interested in East Asian music. You too, have helped get find value in music I would not have heard otherwise. Thanks for all you do! Herbie Mann has always struck me as a sincere and talented musician who has his heart in the right place. Thank you very much for this Dr. V! ….previous anonymous comment was from me.